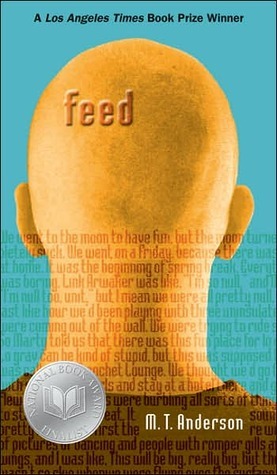 Feed, written in the early 2000s, is set in a not-too-distant future where humans are connected to the Feed fulltime – a brain chip connects everyone to the internet, all of the time. I’m pretty sure I came across this book as a recommendation off the back of Twinmaker, although of course it’s much older, but I’m not 100% sure. Either way, I can certainly see the parallels, although similar ideas are visible in the Bumped duology and lots of other books which aren’t coming to mind right now. Feed has the potential to be something brilliant – an inspection of our reliance on technology, our consumer-obsessed world, of the devolution of teenagers into brain-dead sheeple who follow the latest trends without thinking them through, for whom having is more important than getting, and who are making interaction with the internet more important than interaction with each other. Oh, yes, Feed has plenty of potential. It could be a searing and honest account of the dangers of technology and the importance of simple human interaction. But it just misses the point completely, as far as I’m concerned. Feed depicts a world where advertising is inside one’s head, where everyone speaks in the vernacular which is common for teenagers, where attention-spans are lightning-fast and where interaction with each other is unnecessary as long as one has the Feed – it’s a bleak picture, alright, and certainly somewhere our world could go, but it’s just taken things a step too far, I think. Feed sacrifices plot and character development for the sake of trying to make the reader uncomfortable that this is where our society could go if we’re not careful. The thing is, though, it overlooks the fact that every capable, rational adult is able to distinguish between situations, that register and tone are functions of language, that advertising might be intruding into more areas of our life, but clearly not everyone is okay with this or AdBlock wouldn’t exist, and myriad other things which are too nit-picky for me to think of right now. Feed paints a picture of a world where someone who can’t be categorised and thus advertised to is incapable of functioning, is useless to society, in a world where school and everything else is run by advertising companies. It’s bleak and, to be honest, it’s just boring. Feed doesn’t make me think about the state of the world today because it pushes things to the point of ridiculousness. If the world-building was backed up by stronger character development or plot, then maybe I’d be more willing to entertain ideas floated in the book. The fact of the matter is, though, Feed is based entirely on saying ‘this is how the world could look, this is bad!!! !’ and it doesn’t have anything beyond that to hook me into the book. I was sorely disappointed.